Chinese orbital launch vehicle. By the late 2000 a leading candidate for China's first reusable launch vehicle was a CALT-designed two-stage fully reusable rocket similar to the Kistler K-1. Status: Design 2001. Payload: 2,000 kg (4,400 lb). Thrust: 4,700.00 kN (1,056,600 lbf). Gross mass: 400,000 kg (880,000 lb). Height: 32.00 m (104.00 ft). Diameter: 5.00 m (16.40 ft). Apogee: 200 km (120 mi). 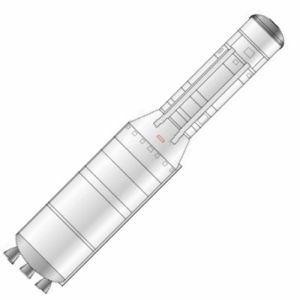 The design clearly was an evolutionary approach using engines and tooling developed for the CZ-5 modern expendable launch vehicles. The first stage would use four 120-metric ton thrust Lox/Kerosene engines. The vehicle was 35.2m long, 5 m in diameter, and would be capable of sending a 2-metric ton payload into a 200 km altitude circular orbit. The stages would make ballistic reentries and land near the launch point using parachutes and airbags. The airframe was designed for 50 flights, with the engines having to be replaced after 10 flights. This was clearly much less ambitious and more achievable than the earlier 921-3 winged two-stage-to-orbit design. It was said that a final selection would be made from six RLV proposals by the end of 2000. The selected design would not be in service before the second decade of the 21st Century. LEO Payload: 2,000 kg (4,400 lb) to a 200 km orbit at 65.00 degrees. Family: orbital launch vehicle. Country: China. Agency: CALT. Bibliography: 424.